Gilad Shalit ( גלעד שליט (help·info), Gilˁad Šaliṭ, born 28 August 1986) is a former MIA soldier of the Israel Defense Forces (IDF) who on 25 June 2006, was captured by Hamas militants in a cross-border raid via underground tunnels near the Israeli border. Hamas held him captive for over five years, until his release on 18 October 2011 as part of a prisoner exchange deal. Captured in Israel by Hamas militants, and held hostage for five years until released in exchange for 1,027 Palestinian prisoners. During his captivity, Hamas turned down requests from the International Committee of the Red Cross (ICRC) to be allowed to visit Shalit, claiming that any such visit could betray his location. Multiple human rights organizations criticized this stance, claiming that the conditions of Shalit's confinement were contrary to international humanitarian law. The Red Cross insisted, "The Shalit family have the right under international humanitarian law to be in contact with their son". The only communication in the early months came through an intermediary, who claimed that a low-ranking Hamas official, Ghazi Hamad, asked him to convey to Shalit's parents assurance that Shalit was "alive and was treated according to Islam's laws regarding prisoners of war, in other words, he had been given shelter, food and medical care." The United Nations Fact Finding Mission on the Gaza Conflict called for Shalit's release in its September 2009 report. In its 27 May 2011 Deauville Declaration, the G8 demanded Shalit's release. Shalit's capture has been deemed a kidnapping and abduction by many sources. He was not granted any visits from the Red Cross and was not allowed to communicate with family members (to which he is entitled as a captured soldier under the Geneva Conventions), and a ransom, even if not of a monetary nature, was demanded for his return. The only contact between Shalit and the outside world after his capture and before his release were three letters, an audio tape, and a DVD that Israel received in return for releasing 20 female Palestinian prisoners. Shalit was captured near the Kerem Shalom crossing in Israel, and held by Hamas as a hostage at an unknown location in the Gaza Strip. Hamas' initial demands of releasing of all female and underage Palestinians as well as Marwan Barghouti were not met. On 18 October 2011, he was released in a deal that secured his freedom after more than five years in isolation and captivity, in exchange for 1,027 Palestinian prisoners, including some convicted of multiple murders and carrying out attacks against Israeli civilians (according to Israeli government sources, the prisoners released were collectively responsible for 569 Israeli deaths). Shalit was the first Israeli soldier captured by Palestinian militants since Nachshon Wachsman in 1994. Shalit, having a rank of Corporal in the IDF's Armor Corps at the time of his capture, was promoted to Staff Sergeant, Sergeant First Class, and then Sergeant Major on the eve of his release. Shalit was born on 28 August 1986 in Nahariya, Israel, to Noam and Aviva Shalit. He has an older brother and a younger sister. He was raised from the age of two in Mitzpe Hila in the Western Galilee. He graduated with distinction from Manor Kabri High School. He began military service in the Israel Defense Forces in July 2005, and "despite a low medical rating, chose to serve in a combat unit, following his older brother, Yoel, into the armored corps." He holds dual Israeli and French citizenship, the latter via his grandmother. The capture of Shalit was one of the more notable events that took place during the June/July 2006 flare-up of hostilities between Gaza and Israel, the others being the Gaza beach explosion (2006) and the Muamar family detention incident. Noam Chomsky has drawn attention to the cause-and-effect and also to the differences in treatment in the Western media between the Muamar detention that took place a day earlier, and the abduction of Gilad Shalit. The Israeli army seized the two Palestinian Muamar brothers in an overnight raid into the southern Gaza Strip on 24 June 2006, who were accused of being members of Hamas and planning attacks on Israel. Hamas said they were sons of a member but were not involved in Hamas. Shalit on Hamas poster in Nablus, 7 May 2007; reads: "Our champion captives. May we have a new Gilad each year, and down :"They (Palestinian prisoners) are not alone". Early on 25 June 2006, Palestinian militants from the Izz ad-Din al-Qassam Brigades, Popular Resistance Committees, and Army of Islam crossed into Israel from the Gaza Strip through an underground tunnel near Kerem Shalom, and attacked an IDF post. Two Israeli soldiers were killed and another two, apart from Shalit, were wounded. Two of the attacking Palestinian militants were also killed. Shalit suffered a broken left hand and a light shoulder wound, and the militants captured him and took him via a tunnel into Gaza. Shalit's captors issued a statement the following day, offering information on Shalit if Israel were to agree to release all female Palestinian prisoners and all Palestinian prisoners under the age of 18. The statement was issued by the Izz ad-Din al-Qassam Brigades, the Popular Resistance Committees (which includes members of Fatah, Islamic Jihad, and Hamas), and a previously unknown group calling itself the Army of Islam. Shalit was the first Israeli soldier captured by Palestinians since Nachshon Wachsman, in 1994. His capture and the following cross-border raid by Hezbollah, resulting in the capture of IDF soldiers Ehud Goldwasser and Eldad Regev into Lebanon, occurred prior to the conflicts in Gaza and Lebanon during summer 2006. The high-ranking Hamas commander whom Israel considers responsible for masterminding Shalit's capture, Abu Jibril Shimali, was killed during the violent clashes between Hamas and the al-Qaida-affiliated Jund Ansar Allah organization in Gaza in August 2009. Israeli forces entered Khan Yunis on 28 June 2006 to restore quiet after repeated rocket attacks. Freeing Shalit was not one of the objectives of the mission called "Summer Rains". According to an Israeli embassy spokesperson, "Israel did everything it could in exhausting all diplomatic options and gave Mahmoud Abbas the opportunity to return the abducted Israeli… This operation can be terminated immediately, conditioned on the release of Gilad Shalit." On the same day, four Israeli Air Force aircraft flew over Syrian President Bashar al-Assad's palace in Latakia, because Israel views the Syrian leadership as a sponsor of Hamas, according to an IDF spokesperson. The operation did not succeed in finding Shalit. On 29 June, the commander of the Israeli Southern Command, Aluf Yoav Galant, confirmed that Shalit was still in Gaza. Israel's Minister of Justice, Haim Ramon, added that Shalit was being held in southern Gaza, specifically. A military correspondent for the Israel Broadcasting Authority said that Shalit was being held captive in Rafah in southern Gaza, and that there was indication that he was still alive. However, IDF spokesperson Brig. Gen. Miri Regev said: "we are not convinced he is being held in southern Gaza… [only] that he is being held in Gaza". On 1 July, the BBC reported that Shalit had been treated by a Palestinian physician for a broken hand and a light shoulder wound. Israeli government authorities threatened that the "sky will fall" if Shalit were harmed. On the same day, Shalit's captors demanded that Israel release an additional 1,000 Palestinian prisoners (in addition to all female and minor prisoners, as previously demanded). Prime Minister Ehud Olmert immediately ruled out negotiations with Shalit's captors, demanding his unconditional release. "There will be no negotiations to release prisoners," the Prime Minister's Bureau said in a statement. "The government of Israel will not give in to extortion by the Palestinian Authority and the Hamas government, which are headed by murderous terror organizations. The Palestinian Authority bears full responsibility for the welfare of Gilad Shalit and for returning him to Israel in good condition." The Apostolic Nuncio to Israel, Archbishop Antonio Franco, attempted to secure Shalit's release via the Catholic Church's Gaza-based parish. He was not successful. In September 2006, Egyptian mediators received a letter in which Shalit wrote that he was alive and well. The handwriting was confirmed to be that of Shalit. In October, Egypt was also reported to be negotiating with Hamas on behalf of Israel for Shalit's release. On 28 October 2006, the Popular Resistance Committees (PRC) said in a statement that all three parties had agreed to a proposal by Egyptian mediators regarding Shalit's release. The PRC did not provide details, but said that the Egyptian proposal would include the release of Palestinians held by Israel. It was the first time since Shalit's capture that any of the factions indicated that his release might be imminent. In November 2006, Hamas leader Khaled Mashal indicated that Shalit was alive and in good health. "has not been harmed at all ... He is being treated in accordance with Islamic values regulating the treatment of prisoners of war." He also said: "We have managed to keep the soldier in captivity for six months and we have no problem keeping him for years." On 17 January 2007, one of the captor groups, the Army of Islam headed by Mumtaz Dormush, claimed that Shalit was being held exclusively by Hamas. On 8 March 2007, Jerusalem Post reported that an agreement had been reached with Hamas over the number of prisoners Israel would release in return for Shalit. Israel and Hamas were still negotiating specific prisoners who Hamas wanted freed in return for Shalit. On 7 April 2007, it was reported that Shalit's captors had transferred to Israel, through Egyptian mediators, a list of Palestinian prisoners they wanted freed. The list included names of approximately 1,300 prisoners, some of whom were high-ranking Fatah members. On 25 June 2007, a year after Shalit's capture, the Izz ad-Din al-Qassam Brigades released an audio tape on YouTube in which Shalit is heard sending a message to his family, friends, and the Israeli government and army, and appealing for a prisoner-swap deal to be reached to secure his release. Shalit said that his medical condition was deteriorating, and that he required immediate and lengthy hospitalization. On 4 February 2008, it was reported that Hamas had sent Shalit's family a second letter written by him. The handwriting was confirmed to be that of Shalit. Shalit's father, Noam, met with former United States President Jimmy Carter during Carter's April 2008 visit to Israel. Carter planned to visit Khaled Meshal of Hamas in Damascus later. Noam Shalit said that the fact that Carter was not considered pro-Israel could be beneficial in securing his son's release. On 9 June 2008, it was reported that Hamas sent Shalit's family a third letter. The group had promised to send them a third letter after mediation from Carter. The handwriting was confirmed to be Shalit's. On 12 August 2008, Hamas said that it was suspending talks on Shalit's release, demanding a complete lifting of the Israeli siege. The decision angered Egypt, a mediator for Shalit's release. Hamas criticized the Egyptians for linking the opening of the Rafah border crossing with Shalit's release, a condition to which Hamas refused to agree. On 20 August 2008, in his briefing to the United Nations Security Council, the Under-Secretary-General of the UN appeared to link the decision to release 200 Palestinian prisoners to the case, though a Hamas spokesman saw it as an attempt to increase Palestinian internal divisions by releasing only those loyal to the Fatah faction. On 11 May 2010, Russian President Dmitry Medvedev called for Shalit to be freed "as soon as possible". He made the call while meeting Hamas leaders in Damascus, Syria. "The Russian president urged solving the problem of releasing Israeli citizen Gilad Shalit as soon as possible," his spokeswoman said. Russia is the only country that has direct dialogue with Hamas. Hamas leader Khaled Meshaal reportedly said Hamas would only consider releasing Shalit when Israel resumed talks to free Palestinian prisoners. PA President Mahmoud Abbas called for the release of Shalit in a press conference with visiting German President Christian Wulff. Shalit's father had blamed the U.S. for blocking talks on his son's release. Netanyahu responded to a pilgrimage march, called by Shalit's father for his release, by saying he was willing to release 1,000 Palestinian prisoners in exchange for Shalit, but that top Hamas leaders would not be among those released. In early 2011, Egyptian-moderated negotiations continued between the Israeli government and Hamas, represented by Ahmed Jabari. Haaretz reported that Israel proposed a prisoner swap, and threatened that if Hamas rejected the proposal, no swap would occur. Hamas responded by warning that an end to negotiations would lead to Shalit's "disappearance." Negotiations were hung up over disagreements between the two parties regarding Israel's unwillingness to release all of the so-called "senior prisoners" into the West Bank—a demand Hamas rejects—and regarding the particulars of releasing prisoners who were leaders of Hamas and other organizations. On 11 October 2011, the Pan-Arabist Al Arabiya network reported that Israel and Hamas had reached an agreement on Shalit. Netanyahu convened a special Cabinet meeting to approve the Shalit deal. Shalit's release negotiations include the release of 1,027 Hamas and Palestinian prisoners by Israel. Despite poor relations with Israel at the time, the Republic of Turkey played a significant yet silent role in Shalit's release. President Peres publicly thanked Turkish Prime Minister Recep Tayyip Erdogan for showing compassion to Shalit. On 18 October 2011, Shalit was transferred to Israel. The IDF transferred him, via helicopter, to the base in Tel-Nof, where he was reunited with his parents and met the prime minister Benjamin Netanyahu. In the base he went through medical tests; it was found that he was malnourished and suffered from vitamin deficiencies. After the tests were completed, he was then transferred by helicopter to his home, where many who supported his release waited outside his house to see his return. Shalit subsequently began to rehabilitate with IDF assistance. The vast majority of Israel's citizens are in favor of the deal, although a vocal minority opposes it, creating essentially two camps. One camp supports the release of Shalit on Hamas's conditions. According to the Dahaf Polling Institute, 79 percent of Israelis favour this deal, which would include the release of over 1,000 Palestinian prisoners and the deportation of some of them outside the territory of the Palestinian National Authority or restricting them to Gaza. A second camp said that Shalit should be released, but not on Hamas's conditions. They argue that the correct approach is to protect Israelis if the prisoners are released. According to the Dahaf Polling Institute, 14 percent of Israelis are in this camp. Others believe that the disagreement among Israelis represents rifts and changes within Israeli society. Attorney Dalia Gavriely-Nur, a lecturer at Bar-Ilan University, said that the camp opposing the prisoners deal is holding onto a view of collectivist society, in which the individual was expected to sacrifice himself for the good of society; the camp supporting the prisoner release is expressing, however, a high value on the sanctity of life, that symbolizes a shift to a more privatized society. Noam Shalit, Gilad's father, urged the UN to take all possible measures to implement the findings of the Goldstone Report. The Goldstone Report called for Shalit's immediate release and, while he was in captivity, for access to him by the International Committee of the Red Cross. On the evening of Shalit's 23rd birthday, on 28 August 2009, thousands attended a vigil for Shalit at the Western Wall, and dozens of activists protested outside Defense Ministry headquarters in Tel Aviv, slamming Defense Minister Ehud Barak and criticizing IDF Chief of Staff Gabi Ashkenazi. The Jewish Internet Defense Force (JIDF) organized in August 2009 a pro-Shalit campaign on the social networking site Twitter. Twitter users drove Shalit's name to the second-highest trend on the day of his 23rd birthday. Tweets for Shalit ranged from the demand "Free Shalit", to requests for international supervision of the case. In several incidents during 2009, leaders of the campaign to free Shalit demonstrated at the prisons in which Palestinian detainees were held, preventing visits by Palestinian prisoners' families. One such demonstration at the Erez crossing on the Gaza border blocked the passage of food and medicine to the Gaza Strip. Israel said it would not ease its blockade of Gaza until Shalit was freed. The abducted soldier's long plight was extremely emotional issue within Israel, with large, tearful rallies on his birthdays and frequent media appearances by his father. Reflecting wide support for the cause, one Israeli TV anchor ended his daily newscast by mournfully reciting how many days the soldier has been held captive. Israeli opponents of such a deal spoke out, warning that releasing top Palestinian militants could result in the deaths of many Israelis in renewed attacks, as well as increased Palestinian motivation to kidnap more soldiers in the future. Israeli analyst Dan Schueftan called the possible swap deal "the greatest significant victory for terrorism that Israel has made possible." No modern government has the legal right to free terrorists in exchange for its own kidnapped citizens, military or civilian. Under long-standing international law, every state has a primary obligation to protect its citizens. Yet it appears that tomorrow, Israel Prime Minister Binyamin Netanyahu will exchange Palestinian terrorists for kidnapped IDF soldier Gilad Schalit. Any such exchange, however humane to Schalit and his family, would imperil thousands of other Israelis. In early December 2008, during a Hamas rally in Gaza City to mark 21 years since its founding, a Hamas member masquerading as Shalit was paraded by Hamas militia members. Hamas's refusal to negotiate about the status of Shalit or even to provide further information about his status strained the temporary Israel-Hamas cease-fire enacted in June 2008. "Shalit may have been wounded, and he may not have been. The subject no longer interests us. We are not interested in his well-being at all, and we are not giving him any special guard since he is as good as a cat or less." On 22 January 2009, Israel indicated that it was willing to swap Palestinians held in Israeli jails for Shalit as part of a longer-term truce after the three-week military operation in Gaza. On 26 January 2009, it was reported that Israel was offering to free 1,000 prisoners in exchange for Shalit. On 16 March 2009, it was reported that a prisoner-swap deal to gain Shalit's release was close, and the negotiation team was urged to wrap up the deal. Israel agreed to release more than 1,000 Palestinian prisoners, but there were still disagreements over the number of prisoners. The negotiation team however deadlocked over the release of 450 "heavyweight" prisoners. According to a senior source in the PM's Office, "a deal cannot be finalized on such terms, and there's nothing to vote on [in the government session] Tuesday". In May 2009, President Shimon Peres invited Shalit's family to meet Pope Benedict XVI at the President's residence in Jerusalem. In June 2009, Israeli human rights group B'Tselem published an ad in the West Bank Palestinian newspaper Al-Quds, calling on Hamas to release Shalit "immediately and unconditionally", but the Gaza-based daily Palestine refused to print it, according to a B'Tselem spokeswoman. In July 2009, Hamas TV in Gaza broadcast a short animated movie that depicted Shalit chained to a jail cell wall, pleading with a Palestinian boy to be set free. The boy refuses, saying he has relatives in Israeli prisons. In July 2009, Noam Shalit, Gilad's father, testified before the Goldstone Committee, which was investigating on behalf of the United Nations illegal conduct by combatants during Gaza War. Shalit told the committee that his son has lived without human rights for three years, and that no one, including the Red Cross, knows what happened to him or has paid him a visit. The Jerusalem Post reported that it obtained photographs showing children at the graduation ceremony of a Hamas-run summer camp, reenacting Shalit's abduction. The photos were reported to show Osama Mazini, a senior Hamas political official in charge of the Shalit negotiations with Israel, attending the play. On 30 September 2009, Israel announced that it would release 20 female Palestinian prisoners in exchange for a video proving Shalit was still alive. The video was attributed to intervention by Switzerland. The exchange took place successfully on 2 October. Hamas turned over a two-minute 40-second video to Israel. Senior IDF officers, Defense Minister Ehud Barak, and Prime Minister Benjamin Netanyahu viewed the footage, after which Barak spoke to Shalit's father Noam and grandfather Zvi by telephone. The video was sent to the Shalit family home in Mitzpe Hila, with the family reportedly viewing it together. Members of the Israeli negotiating team for Shalit's release viewed the footage to ensure it met with Israel's demands, primarily with regard to how recently it was filmed. The video on YouTube, the only contact from Shalit other than three letters written by him and an audio tape released in June 2007, was released to the public at around 4:00 in the afternoon on Israeli television. In the video, Shalit is seen sitting in a chair in a bare room, looking frail and emaciated but otherwise healthy. He addressed Netanyahu and his parents, and reminisced about times he spent with his family. At the end of the video, he stated that the "Mujahideen of the Izz ad-Din al-Qassam Brigades are treating me very well". During the video, he held up a newspaper dated 14 September 2009. Israel transferred 19 Palestinian women being held in Hadarim Prison near Netanya to the Ofer and Shikma detention facilities, ahead of their final release. As soon as it was determined that the video met Israel's demands, the detainees were released and turned over to Red Cross vehicles, which transported them to the West Bank. Another female prisoner was slated for release by the Israel Prison Service, but it was found that she had already been released for good behavior. Another female prisoner was then selected as her substitute, and released on 4 October. In 2010, at least two cathedrals in Switzerland turned off their lights for several minutes in solidarity with Shalit. On the fourth anniversary of Shalit's abduction, the lights of the Colosseum were turned off. and so were the lights around the Old City walls in Jerusalem. A flotilla of ships, called The True Freedom Flotilla, sailed around the Statue of Liberty and past the United Nations. In late June 2010, Shalit's parents organized a march from Shalit's hometown to the Prime Minister's residence in Jerusalem, and were joined by 10,000 people. Shalit's parents stated that they would not go home until he was freed. On the fifth day of the march, as it reached Hadera, Israel agreed to a German-mediated prisoner exchange deal. Under the deal, Hamas would release Shalit, and Israel would release 1,000 Palestinian prisoners. However, Israel stated that the released Palestinians would be barred from entering the West Bank, since this location would afford them access to Israeli cities. Israel also refused to release "arch-terrorists" as part of the deal. Hamas responded by saying that the problem was with who Israel was willing to release, not how many. Hamas demanded that Israel release 450 prisoners jailed for violent attacks on Israelis, but Israel refused to agree to release most of them. In an address, Israeli Prime Minister Netanyahu said Israel was willing to pay a heavy price for Shalit, "but not any price". Shalit's grandfather Zvi called these comments a "death sentence" for Gilad. When a pro-Gilad Shalit release march entered Jerusalem on 8 July, it was met by a group of protesters holding signs "Gilad – Not at any cost" and "Don't give up to terror". The protesters had red ribbons on their hands symbolizing the blood of possible future terror victims resulting from any exchange in terrorists for Shalit's release. Those calling for Shalit's release included celebrities Bar Refaeli and Zubin Mehta. In October 2010, Hamas officials claimed to have thwarted an attempt to locate Shalit. A collaborator in Hamas's military wing was allegedly caught planting bugs in two-way radios. Hamas leaders said the informer maintained relationships with top Hamas commanders in order to learn where Shalit was being held. At the end of November 2010, PA President Mahmoud Abbas called for Shalit to be released, comparing his situation to that of Arab prisoners held in Israeli prisons. In June 2011, French President Nicolas Sarkozy and German Chancellor Angela Merkel, at a joint press conference, issued a call for Shalit's release. This followed Shalit's father, Noam, filing a suit in France to investigate his son's kidnapping. Shalit is a dual citizen of Israel and France. Five years and four months after Shalit was captured by Palestinian militants in southern Israel, a deal was reached between Israel and Hamas to release Shalit in exchange for 1,027 Palestinian and Israeli Arab prisoners. The deal was brokered by German and Egyptian mediators and signed in Egypt on 11 October 2011. Its first phase was executed on 18 October, with Israel releasing 450 Palestinian prisoners and Hamas transferring Shalit to Cairo. On 18 October 2011, Gilad Shalit was returned to Israel as part of the agreement with Hamas. Hamas militants during the exchange wore suicide belts in the event that Israel tried to change the terms at the last minute. The first 447 Palestinian prisoners were also freed and transferred as part of the exchange, the prisoners were also exiled from Israeli territory. Shortly after his release, on 24 October 2011, President Shimon Peres visited Shalit at his home in Mitzpe Hila to congratulate him and wish him well. At this time, Peres called Shalit a hero, and said that he was proud of his ability "to withstand extremely difficult conditions in captivity." Noam Shalit thanked Peres for his efforts in obtaining Shalit's release. France's President Nicolas Sarkozy sent a congratulatory letter to Gilad Shalit, mentioning France's role in pressuring Hamas to release him. In March 2013, the Jerusalem Post released information that Shalit conveyed to IDF investigators after his release. He stated that he was treated well, that he watched all the World Cup games on television, and that he sat on the roof of the home of the family with whom he was housed and looked out at the Mediterranean. The location in which Shalit was held is unknown. According to Israeli Home Front Defense Minister Matan Vilnai, even the leaders of Hamas did not know Shalit's exact whereabouts. Only a small group of militants knew where Shalit was being held, and most of them had been killed in IDF operations. According to Vilnai, "there is a very small group of people who are holding Gilad Shalit who know, and a large number of them are no longer with us". Shortly after the abduction, locating Shalit became a top priority of Israeli intelligence, which soon received false information that he was being held in a fenced private residence on the outskirts of Gaza City. The information had been planted by Hamas to lure the Israelis into raiding the booby-trapped house. Planning for a rescue operation was underway when Israeli intelligence learned of the plot. In June 2007, Israeli media, citing Hamas sources, reported that Shalit was being held in the basement of a booby-trapped building near Rafah in Gaza, and was being cared for by two guards with whom he had established a cordial relationship. Shalit's living quarters were described as a two-room underground store with enough supplies for two weeks, accessible down a ladder through a 15-meter-deep shaft lined with explosives. The report added that the guards receive supplies and newspaper clippings every two weeks, and that they had been ordered to take good care of Shalit. In October 2009, Asharq Al-Awsat reported that a senior Israeli defense official had told the newspaper that Israel knew exactly where Shalit was being held, and was keeping the location under constant surveillance. The newspaper reported that Hamas was aware that Israel knew Shalit's location, and responded by booby-trapping the area, surrounding it with explosives in a 400–500-meter radius, and issuing a directive to kill Shalit if Israel mounted a military rescue operation. In June 2011, the Kuwaiti newspaper Al Jarida reported that Shalit had been transferred to a secret and secure location in Egypt ahead of an expected final deal. The newspaper quoted sources as saying that Shalit had been accompanied by Hamas commanders Ahmed Jabari and Mahmoud al-Zahar. The International Committee of the Red Cross (ICRC) repeatedly asked Hamas for permission to visit Shalit to ascertain his conditions of detention and treatment. Hamas refused the requests. An ICRC representative said that under international humanitarian law Shalit is entitled to regular and unconditional contacts with his family. On 25 June 2007, the Israeli human rights organization B'Tselem issued a statement saying "international humanitarian law absolutely prohibits taking and holding a person by force in order to compel the enemy to meet certain demands, while threatening to harm or kill the person if the demands are not met", and thus holding Shalit as a hostage to their demands is a war crime. B'Tselem also noted that denying access to ICRC visitations is also a violation of international law. Israeli NGO Monitor said that Shalit's abductors breach several provisions of the Third Geneva Convention, e.g., the right to humane treatment (Art. 13); the right to have knowledge of a POW's location (Art. 23); and the right to unfettered access to the Red Cross (Art. 126). Human Rights Watch also stated that Hamas authorities were obligated by the laws of war to allow Shalit to correspond with his family, and noted that three letters and a voice recording cannot be counted as regular correspondence. HRW also called for him to receive visits from the ICRC, and said that the prolonged incommunicado detention of Shalit was cruel and inhumane and amounted to torture. A UN fact-finding mission headed by Judge Richard Goldstone assigned to investigate the Gaza War, which released its Report in September 2009, called for Shalit to be released. In June 2010, on the fourth anniversary of Shalit's kidnapping, Human Rights Watch made a statement describing Hamas' treatment of Shalit as "cruel and inhuman," saying it illustrates the UN definition of torture and violates the international rules of war by prohibiting him from having contact with his family or visits from the Red Cross. Gerald Steinberg, president of "human rights watchdog NGO Monitor", was quoted in October 2011 as saying that many human rights organizations, "such as the UN Human Rights Council, Human Rights Watch, Amnesty International, Euro-Mediterranean Human Rights Network, Gisha, and the International Red Cross demonstrated very little interest" in the Shalit case. In June 2011, the Zionist Federation, among other organizations, stepped up a campaign to ensure that Shalit and his abduction are not forgotten, encouraging members and sympathizers to contact their local MP, MEP and to write letters to newspapers and to Shalit's family with words of support. This followed a two-week Gilad Shalit Awareness Campaign in February, organized by the Embassy of Israel alongside ten other community organizations. Several prominent Israeli, Palestinian, and international human rights organizations issued a joint statement in June 2011 calling on Hamas to end its "illegal" and "inhumane" treatment of Shalit, including Amnesty International, B'Tselem, Bimkom, Gisha, Human Rights Watch, Palestinian Center for Human Rights, Physicians for Human Rights, Public Committee Against Torture in Israel, Rabbis for Human Rights, The Association for Civil Rights in Israel, Yesh Din; though Noah Pollak, writing in Commentary, noted that the statement did not call for the release of Shalit. A protest was also held in August 2011 outside Benjamin Netanyahu's office to mark Shalit's sixth birthday in captivity. Gilad Shalit's father Noam also spoke at the social justice protest in Tel Aviv. The Gilad Shalit Worldwide Tehillim Project was established to support the reciting of Tehillim (Psalms) for Gilad Shalit. The goal is to have all of Tehillim recited daily. Toward Shalit's release, the Israeli Defense Ministry decided, as precedent, that Shalit will be recognized as a disabled veteran with at least 20% disability, immediately upon his release from captivity. Shalit was a corporal when he was abducted, and during his captivity he was promoted to sergeant. After his release, Shalit returned to his parents' home in Mitzpe Hila. His release, the focus of attention in Israel and abroad, attracted many media outlets and ordinary citizens to Mitzpe Hila. Out of courtesy to Shalit, and given the sensitivity of the issue, many Israeli media outlets pledged to avoid intensive coverage that may compromise his privacy. After returning from captivity, Shalit began medical treatment for his injuries. On 4 November, he underwent surgery at Rambam Medical Center in Haifa to remove pieces of shrapnel that had been lodged in his arm during the abduction. During the two-hour operation, doctors found and removed seven pieces of shrapnel from his elbow and forearm, two of which were pressing on nerves. The defense establishment decided to enable Shalit to acclimatize first, after captivity, before beginning the debriefing ordinarily conducted immediately upon the arrival home of Israeli POWs and captives. In January 2012, Noam Shalit, Gilad's father, announced his intention to run on the Israeli Labor Party's candidates list during primaries for the Knesset. On 18 April 2012, Gilad Shalit was discharged from the IDF with the rank of sergeant major. After returning home, Shalit met with, among others, Israeli Prime Minister, Benjamin Netanyahu and French President Nicolas Sarkozy at his residence the Élysée Palace, and he is often followed by the media into sports and other events, in which a public figure is photographed with him. In June 2012, Shalit, an avid sports enthusiast and fan of Maccabi Tel Aviv B.C., found employment as a sports reporter for Yedioth Ahronoth, covering Israeli and European basketball in a regular column. His first assignment was in the United States, covering the 2012 NBA Finals in Oklahoma City. On 16 December 2008, Shalit was named an honorary citizen of Paris, France, after Paris Mayor Bertrand Delanoë and the City Council unanimously voted to give the title to Shalit. The group Collective Freedom for Gilad praised the decision, stating "it is with immense joy that we have welcomed the news, which shows how well the French state is mobilized at every level to make it possible for a young man to regain his freedom and family". The French town of Raincy also named Shalit an honorary citizen, and the Grenoble City Hall hung his photo on their building facade the week of 10 December 2008. During a public menorah-lighting ceremony on 21 December 2008, Gianni Alemanno, the Mayor of Rome, Italy, said that a proposal by Rome Jewish Community President Riccardo Pacifici (the grandson of Riccardo Reuven Pacifici) to make Shalit an honorary citizen of Rome was "an excellent idea." Alemanno added that he wanted to extend the honor "to give a sign of solidarity to the Jewish community." On 16 April 2009, during a formal evening celebrating Israel's 60th anniversary, Alemanno announced that the city declared Shalit an honorary citizen. Alemanno said that the Shalit affair does not concern the State of Israel alone, but the whole of humanity. On 1 July 2009, Alemanno conferred the honor to Shalit at a ceremony and presented a parchment declaration to Shalit's father, Noam. Alemanno said that making Shalit an honorary citizen was "a gesture of high symbolic value, with which Rome chooses to salute the values of life, of solidarity and of respect for the human rights." He added, "You cannot win using violence, kidnapping and ransom." The city of Miami, Florida made Shalit an honorary citizen on 23 April 2009. The move was announced during a municipality council meeting, which also approved a bill declaring Israel's Independence Day as "Israel Day" in Miami. The city of New Orleans, Louisiana made Shalit an honorary citizen on 25 June 2009, the third anniversary of his capture. The city of Baltimore, Maryland made Shalit an honorary citizen on 29 June 2011, the fifth anniversary of his capture. The city of Pittsburgh, Pennsylvania made Shalit an honorary citizen on 30 August 2011, to commemorate his 25th birthday. ^ a b c d "Hamas releases audio of captured Israeli". USA Today. 25 June 2007. ^ a b Levinson, Chaim (11 October 2011). "TIMELINE / 1,940 days from Gilad Shalit's abduction to his release". Haaretz. Retrieved 16 October 2012. ^ "PM vows to end jailed terrorists' privileges". The Jerusalem Post. 23 June 2011. Retrieved 28 June 2011. ^ "Report: Hamas leader Haniyeh sent Netanyahu a conciliatory message". Ynet.com. 18 February 2014. Retrieved 18 February 2014. ^ a b Rory McCarthy. "UN Gaza report accuses Israel and Hamas of war crimes". the Guardian. ^ "The Deauville G-8 Declaration". The White House (Press release). 27 May 2011. Retrieved 28 May 2011. ^ "Commander of Shalit abduction killed by Israeli air strike". FRANCE 24. 9 March 2012. Retrieved 16 November 2012. ^ "News from Israel, Ynetnews – Gaza kidnapping". Ynetnews. 25 June 2006. Retrieved 16 November 2012. ^ "Q&A: Gilad Shalit release deal". BBC News. 18 October 2011. ^ Calev Ben-David (21 December 2009). "Israel Orders More Talks on Shalit Prisoner Swap Deal (Update2)". Bloomberg L.P. Retrieved 29 December 2010. ^ Miskin, Maayana (26 October 2008). "Hamas Demands Release of Notorious Killers". Arutz Sheva. ^ Uri Avnery. "Palestine's Mandela – New Internationalist". ^ Matt Beynon Rees (6 January 2010). "Analysis: The "Palestinian Nelson Mandela". The Boise Weekly. Retrieved 29 December 2010. ^ "חוטפי שליט: הוא לא עונה, זכה לטיפול רפואי וצפה בטלוויזיה". הארץ. ^ , Haaretz.co.il; accessed 14 October 2018. ^ , "[Kidnapped soldier Gilad Shalit"], upi.com; accessed 14 October 2018. ^ a b "In Shalit deal, Israel did cross its own red lines", Haaretz.com, 14 October 2011. – Amnesty International, the human rights group, called for all hostages to be released [...]. ^ "Parents of Gilad Shalit received their son's ranks of Staff Sergeant". Ynet (20 June 1995). Retrieved 29 August 2011. ^ "Shalit Promoted to Rank of IDF Sergeant-major on Eve of Release". Haaretz.com. ^ "Behind the Headlines: Six months in terrorist captivity". Israeli Ministry of Foreign Affairs. 11 January 2007. Retrieved 13 January 2007. ^ * Spencer, Richard (19 October 2011). "Israel: Gilad Shalit 'joked with military doctors over health'". The Daily Telegraph. London. Retrieved 19 October 2011. ^ "Israel captures pair in Gaza raid". BBC. 24 June 2006. Retrieved 1 August 2006. ^ "Gaza fighting impeding Schalit talks". The Jerusalem Post. 14 June 2007. Retrieved 11 April 2009. ^ victoria. "Recognizing the "Unpeople"". Truthout. ^ a b Two soldiers killed, one missing in Kerem Shalom terror attack. Mfa.gov.il. Retrieved 29 August 2011. ^ "Militants issue Israel hostage demands". CNN. 26 June 2006. Archived from the original on 28 June 2006. ^ Rosenberg, David (28 June 2006). "Israeli Army Enters Gaza to Find Kidnapped Soldier (update 2)". Bloomberg. ^ Hanan Greenberg (28 June 2006). "IAF: Aerial flight over Assad's palace". Ynet. Archived from the original on 30 January 2008. Retrieved 25 January 2008. ^ "Today in the News". Israel Broadcasting Authority. 29 June 2006. ^ "Israel: 'Sky will fall' if soldier is harmed". Times of Oman. 5 July 2006. Archived from the original on 25 May 2003. ^ "Palestinian militants say 'discussion closed' on fate of kidnapped soldier after ultimatum expires". Haaretz. 3 July 2006. ^ "Proof of life letter from captive Israeli soldier". News Interactive. 15 September 2006. Archived from the original on 13 October 2009. ^ "Shalit captivity 'to end in days'". Al Jazeera. 26 October 2006. Archived from the original on 7 November 2006. ^ "Hamas predicts new uprising if no peace progress", aawsat.com, 25 November 2006. ^ "Sources: Hamas gives Israel letter from Gilad Shalit", haaretz.com, 4 February 2008. ^ "Shalit's father: Gilad begs for his life in new letter", haaretz.com; 10 June 2008. ^ Avi Issacharoff and Amos Harel, "Hamas says not interested in renewing Shalit negotiations", haaretz.com; accessed 14 October 2018. ^ United Nations Security Council Verbotim Report 5963. S/PV/5963 page 2. Lynn Pascoe 20 August 2008. Retrieved 22 August 2008. ^ "Israel to release 200 Palestinian prisoners". The Irish Times. 17 August 2008. ^ BBC News: "Russian President calls for release of Gilad Shalit", bbc.co.uk, 11 May 2010. ^ SElder Shalit blames US for blocking bargaining talks Archived 22 February 2010 at the Wayback Machine. Shalomlife.com; retrieved 29 August 2011. ^ "Israel ready to deal for Shalit release: Netanyahu". Reuters. 1 July 2010. ^ a b Egypt: Shalit will disappear unless Israel compromises with Hamas|Israel News, haaretz.com; retrieved 29 August 2011. ^ Ravid, Barak. "Israel, Hamas reach Gilad Shalit prisoner exchange deal, officials say". Haaretz. Retrieved 18 October 2011. ^ "Gilad Shalit to return to Israel within hours after High Court rejects bereaved families' petitions". Haaretz. 2 April 2008. Retrieved 18 October 2011. ^ "Turkey working for Shalit's release". Ynetnews. 20 June 1995. Retrieved 16 November 2012. ^ "Israel extends thanks for Shalit help: Voice of Russia". 12 October 2011. Retrieved 16 November 2012. ^ Thomas Seibert (12 November 2012). "Turkey aided effort to free Israeli soldier but relations still frosty". The National. Retrieved 16 November 2012. ^ "How did Turkey save Gilad Shalit?". Hürriyet Daily News. 14 October 2011. Retrieved 16 November 2012. ^ "Reliving History: The Day Gilad Shalit Returned Home". IDF Blog – The Official Blog of the Israel Defense Forces. ^ Mitnick, Joshua (12 October 2011). "Hamas Vows Soldier's Release". The Wall Street Journal. Retrieved 18 October 2011. ^ a b Ahronoth, Yedioth (17 October 2011). "Poll: 79% of Israelis support Shalit deal". Ynetnews. Retrieved 17 October 2011. ^ "Noam Shalit Urges UN to Implement Goldstone Report", Haaretz.com, 1 March 2010. ^ Israelis demand Red Cross visit Shalit, UPI, 25 August 2009. Upi.com. Retrieved 29 August 2011. ^ Protesters block security prisoners' visits at Sharon Prison, YNET, 23 March 2009. Ynetnews.com (20 June 1995). Retrieved 29 August 2011. ^ Haaretz. "Return Gilad Shalit, but not at any price." by Gideon Levy. 30 August 2009. Retrieved 30 August 2009. ^ Israeli Warplanes Bomb Gaza Tunnels, Globalsecurity.org, 2 January 2010; retrieved 29 August 2011. ^ Louis Rene Beres comments in opposition to release of terrorists in exchange for Gilad Shalit, The Jerusalem Post, 17 October 2011. ^ "Gaza Truce May Be Revived by Necessity", The New York Times. 19 December 2008. ^ Hamas: Shalit ‘no longer interests us’, Jewish Telegraphic Agency, 11 January 2009. ^ Report on Shalit, nydailynews.com, 26 January 2009; retrieved 29 August 2011. ^ Federman, Josef (16 March 2009). "Israeli envoys race to free captive soldier". Google. Associated Press. Retrieved 17 March 2009. ^ "Palestinians: Swap talks deadlocked over 'heavyweight' prisoners". Ynet. 17 March 2009. Retrieved 17 March 2009. ^ Peres invites Gilad Shalit's family to meet pope. Haaretz. Retrieved 29 August 2011. ^ Hamas taunts Israel with Gilad Shalit cartoon, Haaretz, 7 July 2009. ^ "Noam Shalit to UN: My son's abduction was a war crime", Haaretz, 7 July 2009. ^ Children stage Shalit abduction, UPI, 27 July 2009. ^ Bousso, Ron (30 September 2009). "Israel to free prisoners for info on captured soldier". Agence France-Presse. Retrieved 30 September 2009. ^ Khoury, Jack. (14 September 2009) Gilad Shalit in video: I've been longing for my freedom for a long time, Haaretz.com; retrieved 29 August 2011. ^ "New York Jews Sail 'True Freedom Flotilla' for Gilad Shalit". Haaretz.com. Retrieved 14 October 2018. ^ Service, Haaretz. (2 June 2010) "Israel willing to pay heavy price to free Gilad Shalit – but not any price", Haaretz.com; retrieved 29 August 2011. ^ July 8, 2010 anti-terrorist exchange protest in Jerusalem, israelnationalnews.com; retrieved 29 August 2011. ^ Freid, Stephanie L.. (14 July 2010) Is Bill Clinton the Key to Winning Gilad Shalit’s Release?. Pajamas Media. Retrieved 29 August 2011. ^ "Hamas allegedly thwarts attempt to locate Gilad Schalit", The Jerusalem Post; retrieved 29 August 2011. ^ Gedalyahu, Tzvi Ben. "Abbas: Free Shalit – 4 ½ Years after He Turned Down His Freedom". Arutz Sheva. Retrieved 30 November 2010. ^ "Captured soldier Gilad Shalit returns to Israel after five years in captivity". News Core. 18 October 2011. Retrieved 18 October 2011. ^ "'Gilad Schalit was accompanied by suicide bombers at time of his release'". The Jerusalem Post. ^ "Swapped Palestinian prisoners to be exiled". EuroNews. 14 October 2011. Retrieved 18 October 2011. ^ "home page - Israel Hayom". Israel Hayom. ^ "Jewish Ideas Daily » Daily Features » Shalit: The French Connection". ^ "Gilad Schalit's capture, in his own words, part II". The Jerusalem Post - JPost.com. ^ "Even Hamas leaders don't know where Shalit is", Haaretz.com; retrieved 29 August 2011. ^ Bergman, Ronen (9 November 2011). "Gilad Shalit and the Rising Price of an Israeli Life". The New York Times. ^ Shalit's father expresses hope Hamas is willing to negotiate, Haaretz; retrieved 29 August 2011. ^ Report: Shalit's Location Known. Arutz Sheva. Retrieved 29 August 2011. ^ Report: Shalit transferred to secure location in Egypt|. Haaretz. Retrieved 29 August 2011. ^ "Exploitation of International Law". NGO Monitor. 21 January 2009. ^ Danon, Danny. (25 June 2010) Hamas has no new information on Schalit. The Jerusalem Post. Retrieved 29 August 2011. ^ "practices of democracy do not sit comfortably with Greens or Labor eggheads". The Australian. 14 October 2011. Retrieved 18 October 2011. ^ Zionist Federation of Great Britain and Ireland. Zionist.org.uk. Retrieved 29 August 2011. ^ Efforts intensify for release of Gilad Shalit on fifth anniversary of his capture Archived 30 June 2011 at the Wayback Machine. Jta.org (26 June 2011). Retrieved 29 August 2011. ^ “Human Rights Community” Agrees: Gilad Shalit Should Remain in Captivity. Commentarymagazine.com (24 June 2011). Retrieved 29 August 2011. ^ "Israelis mark Gilad Shalit's sixth birthday in captivity with protests". Haaretz. 28 August 2011. Retrieved 28 August 2011. ^ "Noam Shalit to speak at Tel Aviv social justice protest". Haaretz. 27 August 2011. Retrieved 28 August 2011. ^ "Gilad Shalit Worldwide Tehillim Project". ^ "התקשורת חתמה על אמנה לא להפר את פרטיות שליט במשך 10 ימים – גלובס". Globes.co.il. 18 October 2011. Retrieved 16 November 2012. ^ "Gilad Shalit undergoes shrapnel removal surgery". Ynetnews. 20 June 1995. Retrieved 16 November 2012. ^ "ynet יותר מ-5 שנים מהפציעה: גלעד שליט נותח בידו – חדשות". Ynet.co.il. 20 June 1995. Retrieved 16 November 2012. ^ "ynet הולך לעבודה: נועם שליט ירוץ לכנסת – חדשות". Ynet.co.il. 20 June 1995. Retrieved 16 November 2012. ^ "Noam Shalit eyes spot on Labor's list". Ynetnews. 20 June 1995. Retrieved 16 November 2012. ^ "חדשות 2 – זה רשמי: גלעד שליט השתחרר מצה"ל". Mako.co.il. Retrieved 16 November 2012. ^ "Netanyahu and Gilad Shalit meet for first time since prisoner swap Israel News". Haaretz. 29 March 2012. Retrieved 16 November 2012. ^ "Gilad Shalit meets Sarkozy in Paris". Ynetnews. 20 June 1995. Retrieved 16 November 2012. ^ Gerhman, Andrew (28 February 2012). "Schalit drops in on All-Star game". The Jerusalem Post. Retrieved 16 November 2012. ^ "Gilad Shalit attends Shlomo Artzi's concert in Caesarea". Ynetnews. Retrieved 16 November 2012. ^ "נענע10 – ואז הראל סקעת פגש את גלעד שליט – סלבס". Celebs.nana10.co.il. 17 June 2009. Retrieved 16 November 2012. ^ Ahren, Raphael (13 June 2012). "Gilad Shalit becomes sports columnist". The Times of Israel. Retrieved 16 November 2012. ^ "Gilad Shalit Lands Job as Sports Reporter". CBN.com. Retrieved 16 November 2012. ^ "Shalit named citizen of Paris". Jewish Telegraphic Agency. 17 December 2008. Archived from the original on 19 September 2009. Retrieved 24 June 2009. ^ "Rome's mayor favors giving Shalit citizenship". Jewish Telegraphic Agency. 23 December 2008. Retrieved 24 June 2009. ^ Khoury, Jack (31 March 2009). "Noam Shalit: Netanyahu must outdo Olmert's attempts to release Gilad". Haaretz. Retrieved 24 June 2009. ^ Shalit named honorary Roman citizen, Jewish Telegraphic Agency (JTA), 2 July 2009. ^ Benhorin, Yitzhak (23 April 2009). "Miami names Shalit honorary citizen". Ynetnews. Retrieved 24 June 2009. ^ "Gilad Shalit is made Honorary Citizen of Baltimore – State of Maryland and Baltimore City Demand his Release"; accessed 29 June 2011. ^ "Israeli prisoner of war named honorary citizen of Pittsburgh", post-gazette.com, 30 August 2011. Wikimedia Commons has media related to Gilad Shalit. 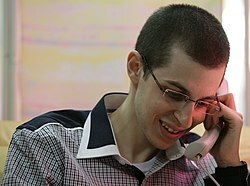 Gilad Shalit: five years of difficult negotiations, onewspaper.com; accessed 14 October 2018.